Borg ships have been detected in the Quadra Sigma system as well as high levels of chroniton particles. This could mean that the Borg are attempting to disrupt the timeline. You are being sent to stop them. 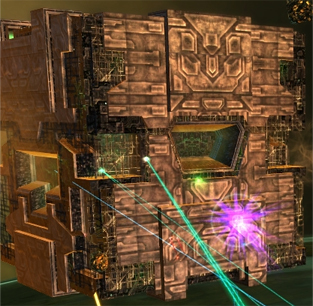 Upon entering the system your team will need to destroy a Borg Tactical Cube which is protecting the Vortex. After it has been destroyed you will need to destroy two Borg Transwarp Conduits and prevent Borg Probes from entering the Time Vortex. There is an optional objective of doing this within 15 minutes and not letting any Borg Probes get through. One person should destroy the Borg Probes that come from the left Transwarp Conduit (Left Probe Guard), and another person should destroy the Borg Probes that come out of the right Transwarp Conduit (Right Probe Guard). Everyone else should start taking out the Nanite Generators and Nanite Transformers on the right side (we'll call them Attackers). As soon as the Tactical Cube is destroyed the Probe Guards should go to their sides, and the Attackers should go to the right side. The Attackers will begin destroying the Nanite Generators and Nanite Transformers furthest from the Vortex. The Right Probe Guard and Left Probe Guard will destroy one Generator and weaken the others while protecting the Vortex. If they feel confident enough, they can go ahead and destroy a second Generator which will cause a Borg Cube to warp in. They will then have to destroy the Cube and probes on their own. Only do this if you are sure you can handle it. This will speed things up for the whole team. After all the Nanite Generators and Nanite Transformers are destroyed on one the right side you can do one of two things. Option A: Weaken the gateway to 10% and then the Attackers move to the Left side to repeat everything. Once the left side Nanite Generators and Nanite Transformers are destroyed weaken the gateway to 10% then destroy them both at the same time. When it comes to destroying both gates you can split the team up into 3 on one side with 2 on the other. Just make sure you clear all the probes first so they don't enter the Vortex. Option B: I prefer this option since it is a little quicker. Destroy the right side gateway and then have the entire team on the left side. When arriving on the left side, help the Left Probe Guard defeat all the ships that have entered the system. The Left Probe Guard should remain on duty. The Right Probe Guard will switch between helping the Left Probe Guard and helping the Attackers. The Attackers will destroy the Nanite Generators, Borg Cubes, Nanite Transformers, and the Gateway. As a side note. If one of the gates is destroyed, spheres will begin coming out of the active gate. If you leave one sphere alive then no more will spawn. This is helpful so that all you need to deal with are probes. Now you can clear up the system of any remaining Borg ships. If you completed the optional obejctive, the reward will be above the Vortex. Now Donatra's Scimitar ship will enter the area. She and the ship have been assimilated and you must defeat her. During the battle some Borg Tractor Probs may come in which use tractor beams to hold you. The Scimitar also cloaks and decloaks if you get too close. Make sure your team stays at least 5km away from the ship. If the ship does cloak you'll need to be careful. Sometimes after decloaking it will have green beams (almost like lasers) coming out of the front. Get behind the Scimitar as quickly as possible because it will release a strong enrgy burst that will most likely destroy your ship. Other than that, just continue to attack the ship until it is destroyed. Congratulations! The ground portion of this mission takes place in a Borg bunker below the surface of the planet. Your team is being sent down there to eliminate the threat to the timeline. You're team will start off at the beginning of the base. As soon as you exit this room (go through the door) the timer for the optional will start. You have 15 minutes to make your way through the base and destroy both IMRs (more about this later). Simply make your way through the base by taking the ramps which go down and defeating any moving Borg along the way. If they are in their alcoves then they will ignore you. Once you have gone down about three levels there will be an opening to another room. The exit in this room is blocked by a shield. The only way to open it is to defeat enough Borg. So if it is still up, just keep defeating Borg. As soon as it is down, have your whole team go through and ignore the remaining Borg (they won't follow). Go through this doorway and take the path to the right which leads to another room. Along the way is an Uplink Data Console which you can use to read some information, but it isn't necessary, so continue. This last room is where some tactics are necessary. This is where the optional objective of destroying the two IMRs (Isolinear Molecular Reconverter) takes place. First, the entire team should clear out the room of any Borg. There are three floors so make sure you get all of the Borg. Next, one person (we will call the Loner) should use the transporter in the center of the room (near the entrance) to transport to another room. Here the Loner will have to disable the shields of the six power nodes. 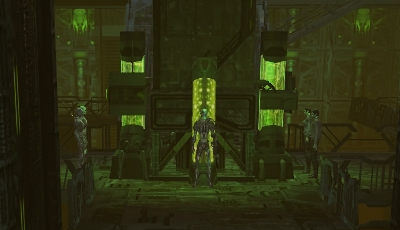 The rest of the team should go to one of the power nodes (there is one on the left and one on the right of each platform) and listen to what the Borg voice says. It will say something like "Intruder in Alpha 1". The Loner will need to activate symbols on the center console. For Alpha 1 you will activate Symbol 1 and Symbol A. The team can also call out which one they are at (i.e. A1 or 1A for Alpha 1). As soon as the shields drop around the node, the team of 4 people will attack and destroy it. IGNORE the Borg that beam in. Even after the node is destroyed, just ignore them. Run to the next power node and repeat until all 6 are destroyed. I can't stress this enough, if you want to get the optional objective you will need to ignore the Borg. If you followed my order above you should end at the Upper Level - Left node. From here one person needs to take the ramp that goes up and destroy the IMR that is here. The Loner needs to use the console to transport back to the main room. The entire team should exit the room through the door they came in. At the end of the ramp is the second IMR. Whoever gets there first should destroy it. Go straight down this hall way into the final room where the Borg leader, Tosk of Borg, is. In order to start the battle with him you need to cross the door. I recommend the team stay outside the door and as soon as you can attack Tosk just focus all fire on him until he is destroyed. Now you can focus on attacking the remaining Borg in this room. Once they are all destroyed, you are done with the mission. Congratulations! Collect your reward.